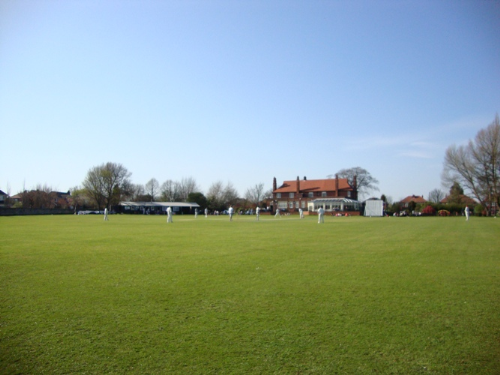 Beautifully situated behind the Ivanhoe Hotel (Sam Smiths) the flat, well draining cricket pitch is a pleaseure to visit, to watch or play cricket. The wicket is looked after by Gareth Horrocks and the outfield is kept immaculate by the members. The backdrop of St Mary's 11th Century Church makes Sprotbrough a perfect place for cricket. Travelling West fron Doncaster (left at the KFC from St Mary's roundabout), the Ivanhoe Hotel is on the left on Melton road just before a crossroads with Thorpe lane and Spring Lane. From the A1, come off at A630 for Rotherham, turn right at the crossroads (traffic lights - right Filter) drive over the river and canal. Turn right at the Junction and follow Thorpe Lane sharp left. Turn right at the crossroads with Melton Road and Turn in to the Ivanhoe Hotel immediately on your right.